SINGAPORE (June 15): Singapore Airlines’ passenger carriage (measured in revenue-passenger-kilometres) fell 2.9% y-o-y in May with a 1.6% reduction in capacity (measured in available-seat-kilometres). Passenger load factor (PLF) dropped 0.9 percentage points to 72.7%, SIA said in a SGX filing on Wednesday. SilkAir’s passenger carriage grew 16.7%, surpassing capacity growth of 15.1%. Consequently, PLF improved by 0.9 percentage points to 69.5%. Scoot's passenger carriage surged 56.9%, with capacity increasing by 60.1% as it added five aircraft to bring its fleet size to 11. Consequently, PLF dropped by 1.6 percentage points to 78.1%. During the month, Scoot saw its eleventh Boeing 787 aircraft enter into service, and also launched flights to three new destinations – Jeddah, Chennai and Amritsar. Scoot now serves 21 destinations, including Singapore. Tigerair’s passenger carriage remained flat year-on-year while capacity increased by 1.5%. Consequently, PLF dropped by 1.1 percentage points to 81.9%. 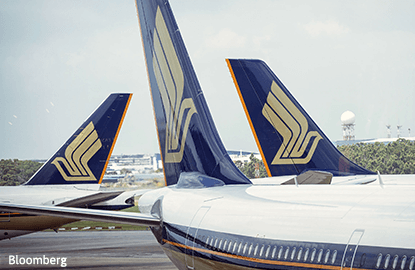 SIA’s overall cargo load factor was 0.7 percentage points higher with cargo traffic (measured in freight-tonne-kilometres) growing 4.7%, outpacing overall capacity increase of 3.6%. “East Asia, Americas and Europe regions showed improvement in load factor with demand outpacing capacity changes,” SIA said. SIA shares fell 0.28% to close at S$10.52 on Wednesday.